The first mention of Sabbath rest was in creation, when God rested on the seventh day (Genesis 2:1-2). God did not need the rest. He decreed the day for human beings to rest from their labors. He set the example us to follow. The religious leaders in Jesus time hated Him from day one, so they looked for any excuse to kill Him. He knew they were waiting for Him. He knew the hardness of their hearts and it made Him angry. He brought on a revolution that broke the mold of tradition. Before Jesus healed the man, He asked two questions of His critics (Read Luke 6), but they didn’t answer. Jesus answered His own questions by healing the man’s hand. He didn’t allow tradition to get in the way of love. Such a beautiful show of compassion drew out the rage of the religious leaders, so they continued to plot His demise. What about us? Are we more concerned with our traditions and prejudices than the needs of human beings? 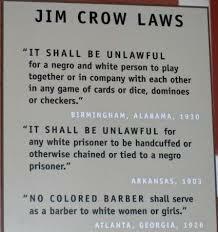 Back in the day of Jim Crow laws, it was unlawful for a Black person to sit with white people and many other such “separate but equal” rules. This included churches that were supposed to be a beacon of love and healing. Black and brown people were regulated to the balcony. We were not allowed to worship with white people, and everyone just accepted it as part of the norms of society. Imagine if Jesus walked into that church and sat with those who were considered inferior. What if He went home with them and shared a meal? Jesus did all of these radical acts while on earth and it drew out the hatred of the religious world. Yet, that’s exactly the way He wants us to live. Listen to what He said to Pharisees: “Woe to you Pharisees, because you give God a tenth of your mint, rue and all other kinds of garden herbs, but you neglect justice and the love of God. You should have practiced the latter without leaving the former undone”. (Luke 11:42). Jesus scathing rebuke to the religious leaders pointed out their hypocrisy. They had broken the two greatest commandments, to love God and people. God is love. He brings joy, light, and healing wherever His love flourishes. Let it flourish in your life so that all people will be blessed.